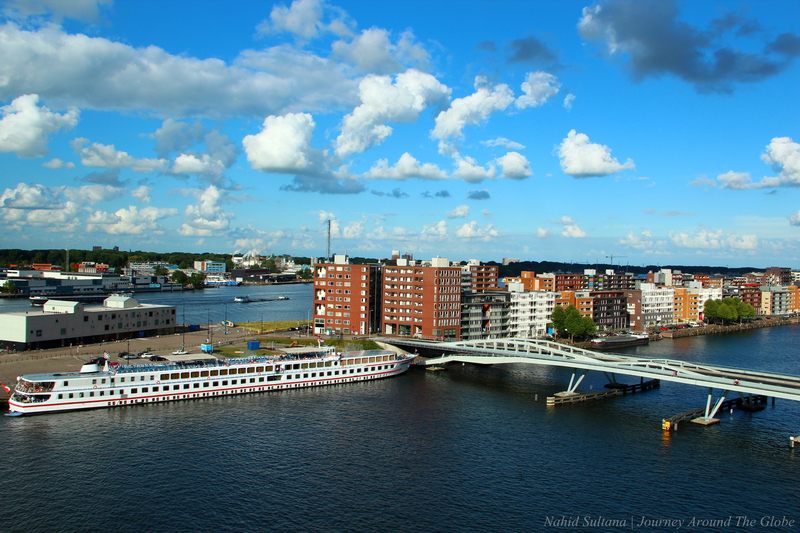 I have mentioned in few of my last posts that we took Baltic Sea cruise last month in August of 2013. It was one of the most unique travel experiences my family and I had this summer. The fun was unlimited for all of us and so was the excitement. Carnival Legend made sure all of its passengers had time of their lives. There were always something exciting going on at every hour for everyone. There is one confession I need to make though, I am not a big water person. In fact, I am very scared of water…that can be going to beaches or swimming pools or simply standing under shower for too long with eyes closed. I don’t know how to swim, therefore, I do panic everytime I am on a boat or taking any other water rides…to the point where I almost forget to enjoy the surroundings. First night of cruising, I kept waking up every hour just to check that our vessel wasn’t sinking or stuck or that there wasn’t any emergency sirens. I kept thinking about the movie Titanic (I know it sounds corny) and some recent cruise incidents (like the one in Italy where 40 people died). I was going through some checklist in my mind on what to do in those situations with my kids…although I know I can’t swim and therefore I can’t really do much. After the first night, I thought I would be ok…it was just getting used to sleeping in moving cabin. But no, that fear and insomnia stayed with me for the whole 12 days on the sea. It’s not that I didn’t sleep at all throughout this journey, but towards the end I used to wake up once or twice in the middle of the night. Apart from that, the good news was that none of us got sea sick or anything. Thanks to my husband who did his homework before buying the tickets and booking our cabin. Double thanks to him for booking a cabin with an extended balcony. Yep, we were on 8th deck with a nice little private balcony with 2 chairs. I managed to wake up very early in the morning few times and enjoy the sunrise right from there in my PJs. TIPS: try to get room in the mid-ship where you can feel motion the least. Front or back of any ship moves a lot and can really give you wobbly feelings if you are not used to it. 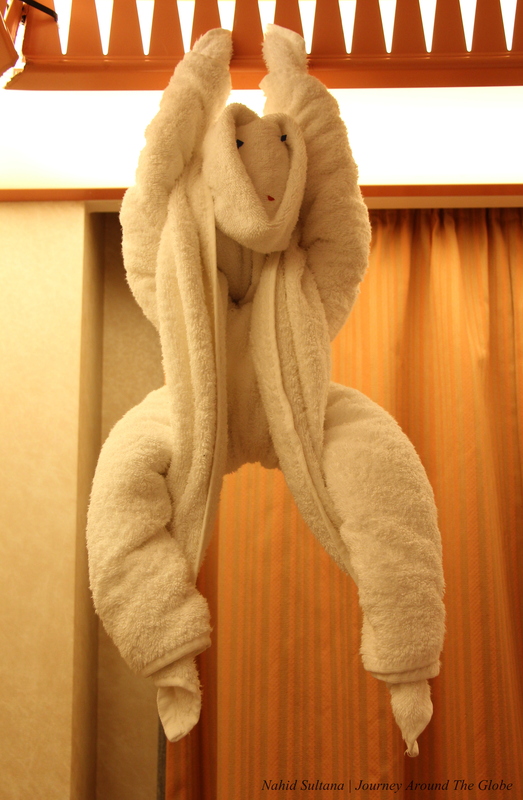 8) Towel folding animals: Our stewards used to visit our room twice a day. Once in the morning for regular servicing and once at night to get ready for bedtime. Every time we were back from our dinner we saw few chocolates, schedule for next day, and a cuddly towel folding animal on our bed. It made the kids giggly and we used to guess each evening what animal he would make for us that night. 7) Free concerts and musical performances everyday: There were more than just 1 or 2 of these concerts going on everyday. We attended Motown Concert on or 2nd day on the sea. Also managed to see piano performance, duet vocal singing, and DJ party by the pool. There were also, few dance classes in each afternoon that covered salsa, tango, Bollywood, disco, and many more. 6) Creative activities: Kids loved some close-up magic times as well as dancing by the pool. “Hairy Chest Competition” was really funny where 4 men competed and entertained a big group. Another really cool one I loved was the ice sculpture curving right in front of our eyes. 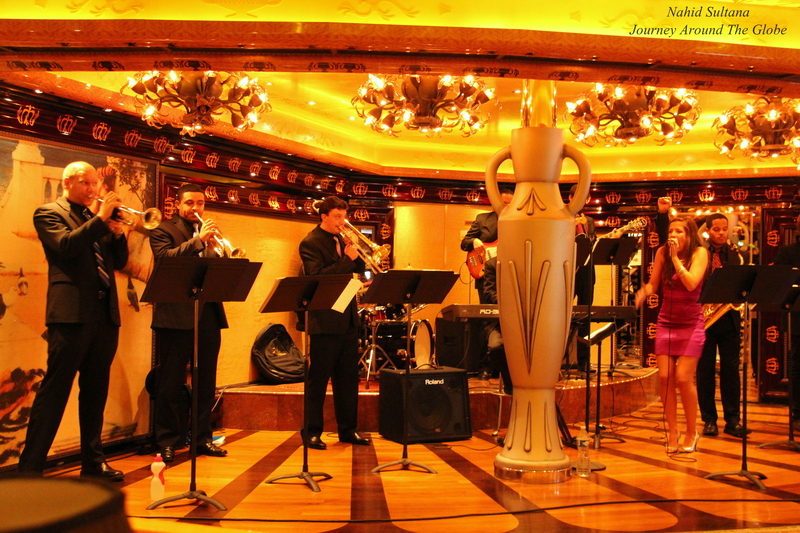 5) Friendly staffs: Our ship, Carnival Legend, had some wonderful…let me repeat, wonderful staffs and workers to serve us. From our room stewards, to all the attendants, cooks, servers, cleaners, receptionists, waiters/waitresses, officials, securities…all had smiley faces and friendly attitude. I can’t imagine to be in a place where I hated the staff. This experience alone added an extra star to our experiences. 4) Shore Excursions: Taking a cruise like this one gives you an easy chance of landing on new places. Particularly with Baltic Cruise, the major highlight was St. Petersburg for almost everyone. Other than that we had the opportunity to see Warnemunde and Rostock in Germany, Helsinki in Finland, and Tallinn in Estonia. These were some wonderful places where we’ve been longing to go for a while. 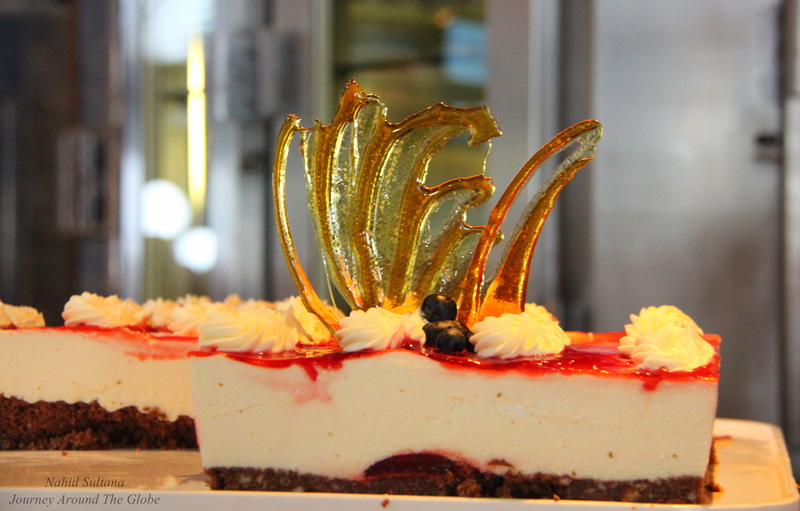 3) Unlimited food: Hehehe…yeh, unlimited food and desserts are in my top list for going back to any cruise. Starting from breakfast to dinner we were stuffed with all sorts of delicious dishes and yummy treats. 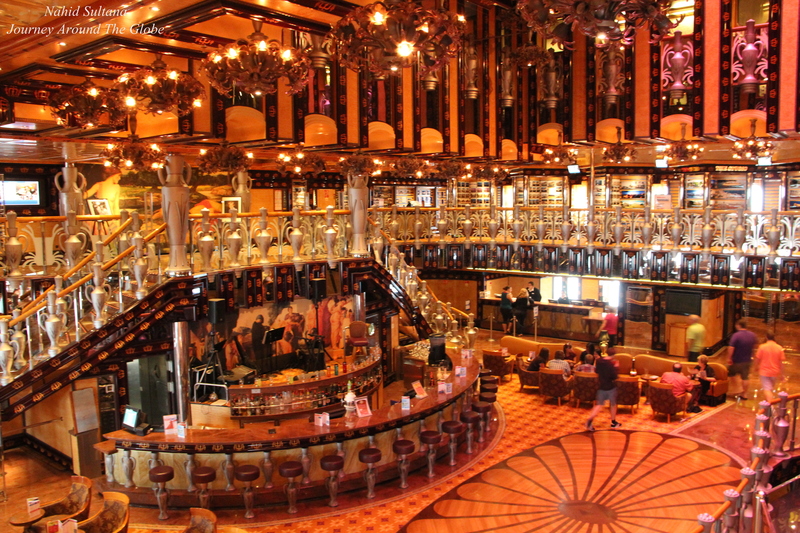 Other than the 4 or 5 different sections for breakfast, in Carnival Legend, we used to have different theme for lunch in buffet service, like American, Mediterranean, Chinese, Italian, Caribbean, and some more. We didn’t go to any “Elegant Night” dinners in formal dining area, but other nights we had dinner in Truffles – a semi-formal sophisticatedly decorated sit down restaurant with lots of menu options. Other than these, there were 24-room service and pizza and ice cream bars where we could just go and munch. 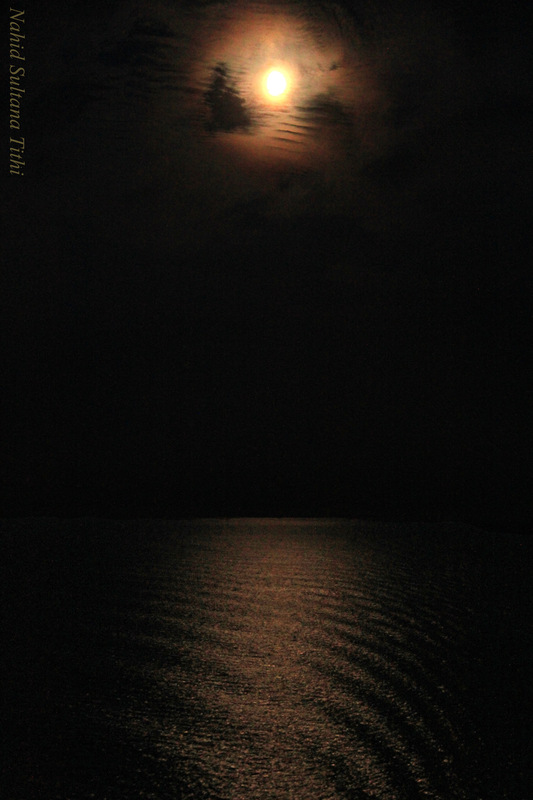 2) Stunning beauty: May be it’s not so stunning when we were just sailing in the middle of blue ocean where we couldn’t see any lands nearby…it may get a bit dull after looking at the sea hours after hours. But my favorite part was during docking in a city and sailing off to a new destination. Amsterdam was probably the best because our ship had to get inside their small canals to anchor. And when we were leaving the city, it took couple hours of scenic canal ride before we were back on the ocean again…which was fantastic. But with most of the cities, as soon as the ship used to come closer to the city and later to the port…I loved to stand on our balcony to see look at other cruise liners, port life, and the whole city from a distance. 1) Sunrises and sunsets: This used to excite me the most before boarding the ship. 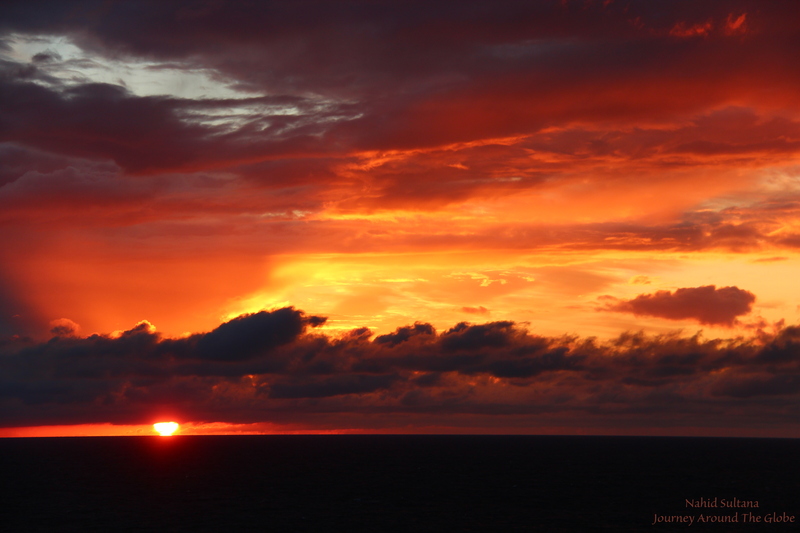 I even bought a lens to capture the sunrises and sunsets on the horizon from our ship. I managed to wake up few times before sunrise and run to the upper deck to enjoy and capture some shots. Same with sunsets, some of them I just enjoyed it from our balcony, some from our restaurants during dinner, while for some sunsets I had time to go to sundeck to get a panoramic view. Capturing or looking at sunrises and sunsets still thrills me when I think about our future cruises. The way water glimmers as the sun rises or sets is a unique experience which I wish could see every day. Overall, it was an unforgettable journey for us and we did maximize our fun on the ship and on the shore by engaging ourselves in different things. Everybody’s festive and holiday mood cheered us too. 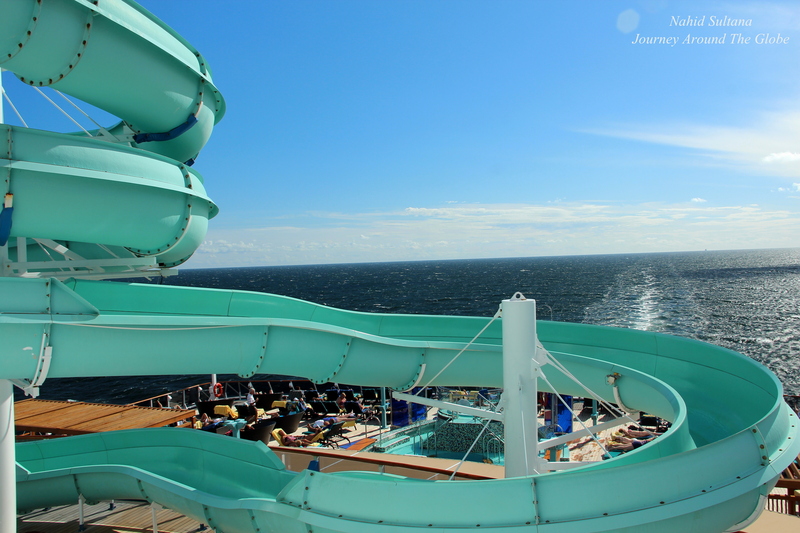 We met an elderly family there who said this was their 15th cruise…wow. I know they are addicted to cruise. I didn’t forget to ask them what their favorite one was; the answer was Alaskan cruise…hmmmmm. That must be an adventurous one, going thru snow-capped mountains and glaciers and solid rock icebergs on the water. Wherever we take our one should be fun…can’t wait til the next cruise. I agree that cruises are a lot of fun. And yes, Alaska was a favorite. I enjoy being out on deck and watching the world go by.